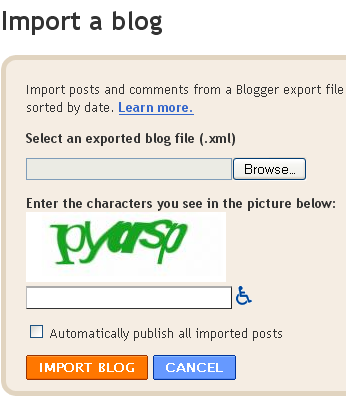 1.Log in to your Blogger dashboard. 5.Now Click "Browse" and choose your old blog file (.xml) from your computor and click "Open". 6.Now type correctly the characters you see in the picture. Note : You can your imported posts publish Automatically,checking box "Automatically publish all imported posts" or you can manualy publish them later.